As explained by a commenter on the previous blog post, the section from Hadley to Cambria, while short, is one of the hardest and most rewarding of the race. Jill and Liehann only got to Cambria late in the day. The section was even more difficult to navigate than anticipated as there was flooding that had moved trees and debris across the trail which was at times impossible to find. They got very lucky as a faster racer caught up with them and guided them through the section. He deliberately stuck with them as he apparently had, in a previous year, left someone behind who ended up spending the night in this section, about which he had felt quite bad. Steve and Di, the couple with which Jill and Liehann rode for quite a while earlier, also caught up with them. Baviaanskloof one of the most beautiful places i have ridden a bike. They got to Willowmore a bit late, but have another long day tomorrow ahead. 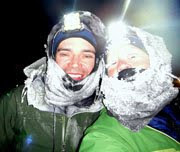 Steve and Di stopped at the checkpoint before Willowmore for the night (or at least that was their plan). Otherwise everything is working well, and there seem to be no issues, physical or mechanical. We thought of Jill and Liehan as we did the Sluicebox 100 Race on mountain bike yesterday (and today). Took us almost 24 hours. Lots of pushing. But Jill and Liehan's adventure made it seem a little easier. Looks like they haven't move in awhile...hope all is well.